Sections 504 and 508 – how it applies to your website. Section 508 is part of the Rehabilitation Act of 1973 which applies to all Federal departments and agencies. A new version of Section 508 was signed into law in 1998 as an amendment of the Rehabilitation Act. It requires Federal agencies to provide persons with disabilities, both employees and members of the public) to have comparable access to and use of electronic information. On January 18, 2017, the Access Board published a “refresh” of Section 508 and Section 255 Guidelines. Section 508 does is not relevant to the private sector websites unless such website is provided under contract to a covered entity. For example, when a Federal agency contracts with a private company for services, such as to gather information for the Federal agency, the section of the company’s website that is used to gather the information is subject to the requirements of Section 508. Section 508 and does not apply to the private sector who are recipients of Federal funds. Who is responsible for Section 508? Section 504 of the Rehabilitation Act of 1973 prohibits the recipients of federal funding from discriminating against an individual because of a disability. Section 504 requires agencies to provide individuals with disabilities equal opportunity to participate in their programs and benefit from their services both their employees and the public sector. provide notice to students, and their parent that the school’s programs are nondiscriminatory. Who does Section 504 apply to? Section 504 specifically applies to private and non-private schools that receive federal funds, directly or indirectly, such as school lunch programs, anti-drug programs, technology grants, government contracts, government loans, etc. If an entity or organization receives funds and organizes a program that is presented to a private school, the school then is a recipient of federal funds indirectly. Upon receipt of the federal funds, the recipient must comply with Section 504. What standards are used for Section 508? 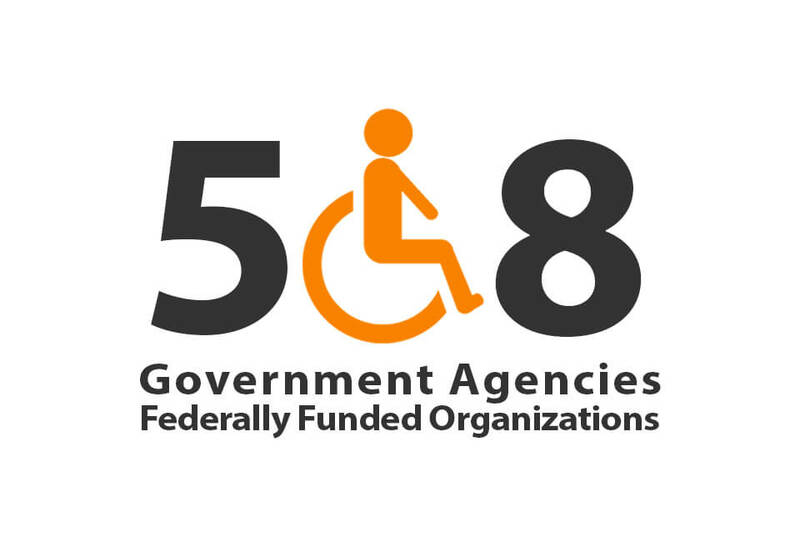 Section 508 has its own set of accessibility standards which are a part of the Federal Acquisition Regulation (FAR) and address access for people with physical, sensory, or cognitive disabilities. The standards apply to software applications and operating systems, web-based information and applications, computers, telecommunications products, video and multi-media and self-contained closed products. Up until January 2018, Section 508 Standards did not give as much detail as WCAG 2.0, and gives a website a pass or fail grade. Since January 2018, Section 508 now uses WCAG standards. Agencies must ensure all public electronic information is compatible with assistive technology devices used by people with disabilities. Even if Section 504 or Section 508 does not apply to your school or organization, Title III of the Americans with Disability Act does. Besides giving all your visitor a useful and pleasant experience when on your website, the OCR enforces the application of the ADA and Section 504 civil rights laws in schools. This statement requires a website, document, PDF or other digital assets a visitor has access to on your website must be accessible to persons with disabilities. An increase in complaints filed by the U.S. Department of Education Office of Civil Rights (OCR) targeting public and private school websites. The ORC website accessibility complaints not that the public-facing websites and the digital documents on the websites fail to comply with federal laws and standards. Complaints have been filed from K-12 through higher education websites. An understanding of the requirements set out by Section 508 and WCAG and how to implement accessibility is the first step. For those who are not up for the steep learning curve of what and how to implement the WCAG requirements and Section 508 Standards, hiring an accessibility professional is the best choice. Get ADA works with businesses, schools and web agencies who have clients with accessibility needs. It’s most cost-effective to incorporate accessible from the very beginning of a web project when the design, page content, documents or forms are being determined.